ENSENADA, Baja California, Mexico—Continuing to add to his legacy nearly every time he hits the desert, legendary Hall of Fame off-road racer Rob MacCachren of Las Vegas has assumed the early lead in the 2017 SCORE Overall and SCORE Trophy Truck point standings in the No. 11 Rockstar MacCachren Motorsports Ford F-150. With nearly 250 career desert and stadium off-road race wins, including eight SCORE season class point championships and one of just nine winners of the SCORE Baja Triple Crown, MacCachren, 52, tops the standings with 81 points after his impressive season-opening overall victory on April 1 in the 31st SCORE San Felipe 250 in Baja California, Mexico. The four-race 2017 SCORE World Desert Championship is being held entirely in Baja California and next up on the 2017 schedule is the 49th annual SCORE Baja 500 to be held May 31-June 4 in Ensenada, Baja California, Mexico. With nearly 300 entries for 30 U.S. States and 20 countries expected to participate in classes for cars, trucks, UTVs, motorcycles and quads, racer registration is underway at http://score-international.com/raceinfo/2017-baja-500/. The 2017 season also marks the golden 50th anniversary celebration of the legendary season-ending SCORE Baja 1000, the iconic Granddaddy of all Desert Races to be held November 14-18. The SCORE Baja 1000 is the oldest and longest continuously held desert race in the world. MacCachren is the all-time leader with 15 career race wins in the featured SCORE Trophy Truck division for high-tech, 850-horsepower, unlimited production trucks including four in the SCORE San Felipe 250. 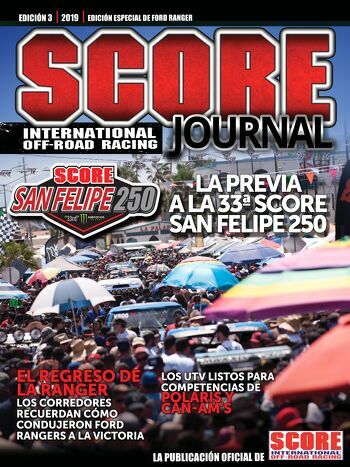 MacCachren, backed up his top-qualifying effort to capture his ninth class win and his fifth overall and fifth in SCORE Trophy Truck in the SCORE San Felipe 250. MacCachren stormed strategically to a penalty-free winning time of four hours, 20 minutes, 15 seconds at a sterling 62.69 miles per hour. Prior to this year, MacCachren’s Overall and SCORE Trophy Truck victories in the SCORE San Felipe 250 have been in 2003 (with Gus Vildosola Sr), 2007 (with Mark Post) and driving solo in 2011 and 2012. MacCachren has also won the overall and SCORE Trophy Truck victory at the legendary season-ending SCORE Baja 1000 for the last three consecutive years. MacCachren leads the SCORE overall point standings in addition to SCORE Trophy Truck but only 10 points separate the top 10 in the SCORE overall point standings. Second in overall points and leading the Trophy Truck Spec class is Elias Hanna, Ensenada, Mexico with 79 points in a Chevy 1500 and third overall and leading Class 10 is second-generation desert racer Broc Dickerson, just 16, of Brawley, Calif., with 76 points in a Chevy-powered Alumi Craft open-wheel desert race car. SCORE point regulations for 2017 has all four-races counting for final points, with three minimum, and one of the four races in the SCORE World Desert Championship that is mandatory to qualify for a class season point championship is for the driver/rider of record to start or finish the SCORE Baja 1000. SCORE points are calculated on a set amount of start points and finish points for a particular race along with a variable amount for placement points for finishers based on the number of starters within the racer’s class. Lining up behind MacCachren in the point standings in the featured SCORE Trophy Truck division are many of the world’s top desert racers. Second in SCORE Trophy Truck points is Billy Wilson, Corpus Christi, Texas with 75 points in the No. 15 Bevly/Wilson Racing Chevy Silverado, third is Carlos ‘Apdaly’ Lopez, Tecate, Mexico, with 71 points in the No. 1 RPM Racing Chevy Rally Truck, fourth is Justin Matney, Bristol, Tenn. with 68 points in the No. 4 RPM Racing Chevy Rally Truck and fifth is B.J. Baldwin, Las Vegas, with 66 points in the No. 97 Monster Energy Toyota Tundra. The second five in the SCORE Trophy Truck after the first round of the four-race 2017 SCORE World Desert Championship is led by Las Vegas’ Tim Herbst with 65 points in the No. 19 Monster Energy Ford F-150. Seventh in SCORE Trophy Truck is Cameron Steele, San Clemente, Calif., with 64 points in the No. 16 Monster Energy Chevy Silverado, eighth is Dan McMillin, La Mesa, Calif. with 63 points in the No. 23 McMillin Racing Ford F-150, ninth is Jesse Jones, Phoenix, with 62 points in the No. 76 Ford F-150 and 10th is Gary Magness, Denver, with 61 points in the No. 45 Mango Racing Ford F-150. In addition to MacCachren in SCORE Trophy Truck, Hanna in Trophy Truck Spec and Dickerson in Class 10, six other classes have at least one racer in the top 21 SCORE Overall point standings after the first race in 2017. The classes in the top 21 are Class 10 (four racers), SCORE Trophy Truck (three), unlimited Class 1 (three racers), Class 1/2-1600 (three), Trophy Truck Spec (two), Pro UTV FI (two) along with additional class point champions in Class 5, Pro UTV and Class 11. Besides SCORE Trophy Truck, Trophy Truck Spec and Class 10, other class leaders also in the top 21 in SCORE Overall points after one of four races include Brad Wilson, Long Beach, Calif., tied for fifth overall and leading the unlimited Class 1 in the No. 153 Wilson Motorsports Jimco-Chevy. Other class point leaders in the top 21 SCORE overall points so far are Jorge Sampietro, Ensenada, Mexico, who is tied for fifth overall and leads Class 1/2-1600 in the No. 1697 Romo-VW, Wayne Matlock, Apline, Calif., who is tied for seventh overall and leads Pro UTV FI in the No. 2971 Can-Am Maverick X3, Vic Bruckmann, Lemon Grove, Calif., who is 10th overall and leads SCORE Lites in the No. 1299 Prill-VW, Daniel Reyes Jr, Mexicali, Mexico, who is tied for 13th overall and leads Class 7 in the No. 715 Ford Ranger and Noah Ostanik, Carlsbad, Calif., who is tied for 18th overall and leads Class 8 in the No. 844 Ford F-150. The 2017 SCORE Overall Motorcycle and Pro Moto Unlimited point leader is the Ox Motorpsorts team led by Mark Samuels, Yucca Valley, Calif., picking up where he left off with Colton Udall, now sidelined by injury, who finished undefeated with four race wins in 2016. The team this year, which includes Australia’s Daymon Stokie and Ryan Penhall, Laguna Niguel, Calif., has 67 points on the No. 1x Honda CRF450X which has captured back-to-back Pro Moto Unlimited titles. With a first place finish in his class in the SCORE San Felipe 250, Wayne Matlock, Alpine, Calif., is the Pro UTV overall point leader as well as the Pro UTV FI class for forced induction engines. Matlock has 73 points in the Pro UTV FI class in his No. 2971 Polaris RZR XP4 Turbo. His point total is also tied him for seventh overall among 4-wheel vehicle classes. Among the other 2017 SCORE class point leaders in the SCORE World Desert Championship in Pro car/truck/UTV classes are Gus Vildosola Sr, Mexicali, Mexico (SCORE TT Legend, Ford Raptor), Luis Lopez, Mexicali, Mexico (Class 5, VW Baja Bug), Paul Champion, Phoenix (Pro UTV, Polaris RZR XP1000), Jorge Gutierrez, El Cajon, Calif. (Class 5-1600, VW Baja Bug) and Eric Solorzano, Tijuana, Mexico (Class 11, VW Sedan). Other class leaders in Pro motorcycle and quad classes include Chad Thornton, Farmington, N.M. (Pro Moto 30, KTM 450XCF), Kevin Johnson, Boulder City, Nev. (Pro Moto 40, Husqvarna 501), Jim O’Neal, Simi Valley, Calif. (Pro Moto Limited, Husqvarna 350), Jose Carrasco, Rosarito Beach, Mexico (Pro Moto Ironman, Yamaha YZ450F), Giovanni Spinali, Lake Forest, Calif. (Pro Moto 50, Honda CRF450X) and Said Sanchez, Tijuana, Mexico (Pro Quad, Honda TRX450R). King Shocks, SCORE’s Official Shock Absorber, is offered a special contingency cash prize for the again this year. The winner with the fastest time through a specific section of each race on corrected elapsed time earns the choice of either a $4,000 cash prize or $5,000 in credit for King Shocks parts or service. Winning the first King Shock Zone award for this year at the SCORE San Felipe 250 was San Diego’s Luke McMillin who had the fastest time between virtual checkpoint No. 4 and VCP No. 7 in the No. 83 McMillin Racing Ford F-150. Qualified vehicles are equipped exclusively with King Race Shocks and contingency decals are placed on the vehicles as required. The 2017 Sportsman motorcycle point leader is Sidney Marchand, Beaumont, Texas with 68 points on the No. 207x KTM 500EXC. Leading the Sportsman Quad division with 68 points is the team led by Juan Dominguez, Yuma, Ariz. on the No. 109a Honda TRX450R. The four-race 2017 SCORE World Desert Championship in Baja California, Mexico along with the SEMA SCORE Baja 1000 Experience/SCORE Baja 1000 Qualifying in Las Vegas will all air on El Rey Network in the United States. International distribution is by way of syndication. The season-ending 50th SCORE Baja 1000 will have a two-hour show produced while the other race shows will each be one-hour telecasts. SCORE TROPHY TRUCK—1. Rob MacCachren, Las Vegas, Ford F-150 (1), 81; 2. Billy Wilson, Corpus Christi, Texas, Chevy Silverado, 75; 3. Carlos ‘Apdaly’ Lopez, Tecate, Mexico, Chevy Rally Truck, 71; 4. Justin Matney, Bristol, Tenn., Chevy Rally Truck, 68; 5. B.J. Baldwin, Las Vegas, Toyota Tundra, 66. 6. Tim Herbst, Las Vegas/Troy Herbst, Las Vegas, Ford F-150, 65; 7. Cameron Steele, San Clemente, Calif., Chevy Silverado, 64; 8. Dan McMillin, La Mesa, Calif., Ford F-150, 63; 9. Jesse Jones, Phoenix, Ford F-150, 62; 10. Gary Magness, Denver, Ford F-150, 61; 11. Corey Keysar, Colorado Springs, Colo., Ford Raptor, 60; 12. Mike Lawrence, Murrieta, Calif., 59; 13. Eric Husted, St. George, Utah, Ford F-150, 58; 14. Larry Connor, Miamisburg, Ohio, Chevy Silverado, 57; 15. Mark Post, Las Vegas/Ed Herbst, Las Vegas, Ford F-150, 56; 16. Damen Jefferies, Apple Valley, Calif., Chevy Silverado, 55. SCORE TT LEGEND—1. Gus Vildosola Sr, Mexicali, Mexico, Ford Raptor (1), 65; 2. Clyde Stacy, Bristol, Va., Rally Diesel, 59. CLASS 1—1. Brad Wilson, Long Beach, Calif., Jimco-Chevy (1), 74; 2. Morgan Langley, Santa Monica, Calif./Kory Halopoff, Anaheim, Calif., Mason-Chevy, 68; 3. Rob Archibald, Lakeside, Calif., Jimco-Chevy, 64; 4. Chris Paxson, Redlands, Calif., Racer-Chevy, 59; 5. Brian Wilson, Lakewood, Calif., Jimco-Chevy, 58; 6. Luis Saenz, El Paso, Texas, Tatum-Chevy, 57; 7. Derek Fletcher, Abingdon, Va./Christyan Samano, Ensenada, Mexico, Tatum-Chevy, 57; 8. Al Torres, El Centro, Calif., Jimco-Chevy, 56; 9. Ricardo Malo, San Diego, Jimco-Chevy, 55. TROPHY TRUCK SPEC—1. Elias Hanna, Ensenada, Mexico, Chevy Silverado (1), 79; 2. John Langley, Santa Monica, Calif./Luke Johnson, Trabuco Canyon, Calif., Mason-Chevy, 73; 3. Lee Banning, Laveen, Ariz., Geiser-Chevy, 69; 4. Chad Broughton, Scotts Valley, Calif., BajaLite-Chevy, 66; 5. Brian Goldstein, Beverly Hills, Calif., Brenthel-Chevy, 64; 6. Pat Simms, Eunice, N.M., ESM-Chevy, 63; 7. Russell Buehler, Liberty, Missouri, Jimco-Chevy, 62; 8. 8. Charles Dorrance, Austin, Texas, Ford Raptor, 61; 9. Bill McBeath, Las Vegas, Ford F-150, 60; 10. Miles Wyatt, Brawley, Calif., Chevy Silverado, 59; 11. Alejandro Perusinaa, redway, Calif., TLR-Chevy, 58; 12. Chelsea Magness, Denver/Steve Knudson, Denver, Mango-Ford, 57; 13. Dion Podgumy, Spring, Texas, BajaLite-Chevy, 56. CLASS 10—1. Broc Dickerson, Brawley, Calif., Alumi Craft-Chevy (1), 76; 2. Justin Davis, Chino Hills, Calif., Custom-Chevy (1), 70; 3. Cody Reid, Apple Valley, Calif./Adam Pfankuch, Carlsbad, Calif., Jefferies-Chevy, 66; 4. Reinaldo Varela, Sao Paolo, Brazil/Eric Stewart, Riverside, Calif., ESM-Honda, 63; 5. Chip Prescott, Fallbrook, Calif., Alumi Craft-Chevy, 61; 6. Lars Ferry, Phoenix, Jimco-Chevy, 60; 7. Kevin Price, Fremont, Calif., Tatum-Chevy, 59; 8. Dimas Diaz, Monterrey, Mexico, Curry-Chevy, 59. CLASS 8—1. Noah Ostanik, Carlsbad, Calif., Ford F-150 (1), 66; 2. Tim Gabbert, Fallbrook, Calif./Scott Ulrich, Fallbrook, Calif., Ford F-150, 60. CLASS 1/2-1600—1. Jorge Sampietro, Ensenada, Mexico/Esteban Sampietro, Ensenada/Misael Arambula, Tijuana, Mexico, Romo-V W (1), 74; 2. Roberto Romo, Mexicali, Mexico/Cody Robinson, El Centro, Calif., Romo-VW, 68; 3. Mario Estrella, Caborca, Mexico, Romo-VW, 64. SCORE LITES—1. Vic Bruckmann, Lemon Grove, Calif./Ramon Bio, Spring Valley, Calif., Prill-VW (1), 71; 2. Rafael Aguirre, Monterrey, Mexico, Foddrill-VW, 65; 3. Matias Arjona IV, Ensenada, Mexico/Matias Arjona III, Ensenada, Mexico, Mirage-VW, 61; 4. Javier Buelna, Mexicali, Mexico/Luvian Voelker, Mexicali, Mexico, Chenowth-VW, 58; 5. Robert Illian, Granada Hills, Calif., Jimco-VW, 56. CLASS 5—1. Luis Lopez, Mexicali, Mexico/Victor Cesena, Cabo San Lucas, Mexico, VW Baja Bug (1), 65. HEAVY METAL—1. Vincent Munez, Yucaipa, Calif./Roy Tomkins, Redlands, Calif./Steven Yates, Yucaipa, Calif., Ford Ranger (1), 65. CLASS 7—1. Daniel Reyes, Mexicali, Mexico, Ford Ranger (1), 68; 2. Mark Johnson, Riverside, Calif./Norris Brown, Jackson, Wyo., Honda Rdgeline, 62; 3. Dan Chamlee, Santa Barbara, Calif., Ford Ranger, 58. PRO UTV FI—1. Wayne Matlock, Alpine, Calif., Polaris RZR XP4 Turbo (1), 73; 2. Marc Burnett, Lakeside, Calif., Can-Am Maverick X3, 67; 3. Brandon Schueler, Phoenix, Polaris RZR XP4 Turbo, 63; 4. Derek Murray, Eastvale, Calif./Jason Murray, Eastvale, Calif., Can-Am Maverick X3, 60; 5. Alonzo Lopez, Murrieta, Calif./Francisco Rodriguez, Murrieta, Calif., Polaris RZR XP4 Turbo, 58; 6. Cory Sappington, Peoria, Ariz./Scott Sappington, Glendale, Ariz., Can-Am Maverick Max Turbo, 57; 7. Sean Cook, Citrus Heights, Calif./Hans Luenger, Brook Park, Ohio, Can-Am Maverick Max, 56; 8. Scott Trafton, Santee, Calif./Marc Behnke, El Cajon, Calif., Polaris RZR XPT1000, 55; 9. Mike Cafro, Fallbrook, Calif./Jamie Kirkpatrick, Olympia, Wash., Polaris RZR XP4 Turbo, 54; 10. Wes Miller, Carlsbad, Calif./Hudson Hall, Portland, Texas, Polaris XP4Turbo, 53; 11. Jose Juarez, Lemon Grove, Calif./Rodolfo Rivera, Chula Vista, Calif., Polaris RZR XP4 Turbo, 52. PRO UTV—1. Paul Champion, Phoenix/Justin Smith, Phoenix, Polaris RZR XP1000 (1), 65; 2. Don Whittington, Fort Lauderdale, Fla./Bill Whittington, Scottsdale, Ariz., Polaris XP1000, 59; 3. Kristen Matlock, Alpine, Calif./Aaron Reed, El Cajon, Calif., Polaris RZR XP4 1000, 55. CLASS 5-1600—1. Jorge Gutierrez, El Cajon, Calif./Miguel De La Mora, Westminister, Calif., VW Baja Bug (1), 65; 2. Hector Hurtado, Tijuana, Mexico, VW Baja Bug, 59; 3. Luis Herrera, Granada Hills, Calif./Ernie Negrete, San Diego, 55; 4. Rodolfo Martinez, Ensenada, Mexico, VW Baja Bug, 52. CLASS 3—1. Ken Leavitt, Jerome, Idaho, Ford Bronco (1), 65. BAJA CHALLENGE—1. Bud Pecoy, W. Des Moines, Iowa/Rolf Helland, Morris, Ill., BTC-Subaru (1), 65; 2. Marco Gonzales, Glendale, Calif./Michael Gonzales, Glendora, Calif., BTC-Subaru, 59; 3. Tim Spurgeon, Danville, Calif., BTC-Subaru, 55. STOCK FULL—1. Justin Gueulette, Canada, Ford F-150 (1), 65. CLASS 11—1. Eric Solorzano, Tijuana, Mexico, VW Sedan (1), 65; 2. Art Penner, Canada, VW Sedan, 59; 3.Dennis Hollenbeck, Ensenada, Mexico, VW Sedan, 55. PRO MOTO UNLIMITED—1. Mark Samuels, Yucca Valley, Calif./Daymon Stokie, Australia/Ryan Penhall, Laguna Niguel, Calif., Honda CRF450X (1), 67; 2. Francisco Arredondo, Guatemala/Shane Esposito, Menifee, Calif./Roberto Villalobos, Dulzura, Calif./Justin Morgan, El Cajon, Calif., Honda CRF450X, 61; 3. Derek Ausserbauer, Santa Ynez, Calif., Honda CRF450X, 57; 4. Mark Winkelman, Cedar Hill, Texas/Austin Miller, Austin, Texas/Grant Statley, La Jolla, Calif./Schuyler Schoonmaker, Alpine, Calif., Huwqvarna 501, 54; 5. Garrett Poucher, Valencia, Calif./Michel Valenzuela, Tijuana Mexico/Jeremy Newton, Seal Beach, Calif., Honda CRF450X, 52. PRO MOTO 30— 1. Chad Thornton, Farmington, N.M./Dennis Belingheri, Reno, Nev./Sal Hernandez, Ensenada, Mexico/Chris Brown, Las Vegas, KTM 450XCF (1), 65; 2. Luis Gomez, Obregon, Mexico/Mario Valenzuela, Obregon, Mexico/Jorge Tamaura, Obregon, Mexico/Eduardo Rosas, Hutabampo, Mexico, Honda CRF450X, 59; 3. Roy Buelna, Ensenada, Mexico/Oscar Hale, Ensenada, Mexico/Gerardo Buelna, Ensenada, Mexico, Yamaha WR450, 55. PRO MOTO 40—1. Kevin Johnson, Boulder City, Nev./Ryan Gustine, San Diego, Husqvarna 501 (1), 65; 2.Jano Montoya, Winter Garden, Fla./Francisco Septien, Ensenada, Mexico/Jeff Kawell, Riverside, Calif., KTM 450XCW (3), 59; 3. Jason Miller/Sterlyn Rigsby, Temecula, Calif./Colie Potter, Las Vegas, Steve Herstad, Bakersfield, Calif./Paul Luce, Albuquerque, N.M., Honda CRF450X, 55. PRO MOTO LIMITED—1. Jim O’Neal, Simi Valley, Calif./Kevin Murphy, Camarillo, Calif./Morgan Crawford, Fresno, Calif., Husqvarna 350 (1), 65; 2. Fernando Beltran, Ensenada, Mexico, Yamaha YZ250F, 59; 3. Santiago Creel, Mexico Cith, Mexico, 55. PRO MOTO IRONMAN—1. Jose Armando Carrasco, Rosarito Beach, Mexico, Suzuki RMZ450X (1), 65; 2. Dominic Fagundes, Tulare, Calif., Yamaha YZ450F, 59; 3. Tony Gera, Santa Cruz, Calif., Honda CRF450X, 55; 4. Gerardo Rojas, Vincente Guerrero, Mexico, KTM 450XCF, 52. PRO MOTO 50—1. Giovanni Spinali, Lake Forest, Calif./Earl Roberts, Mexicali, Mexico/Troy Pearce, Ramona, Calif., Honda CRF450X (1), 66; 2. Rober Gates, Victorville/Doug Smith, Upland, Calif./Steve Williams/Richie Hudson, Lake Havasu City, Ariz./Donald Rohmann, Folsom, Calif., Kawsaki KX450, 60; 3. Marty Gomez, Long Beach, Calif./Mark Winkelman, Cedar Hill, Texas/Flipper Manchester, Reno, Nev./Oscar Fazz, Yuma, Ariz./George Pennington, Denver/Tim Gomez, Long Beach, Calif./Arturo Daviala, Honda CRF450X, 56. PRO MOTO 60—1. Donald Lewis, Manchester, Conn./Ron Dugan, Upland, Calif./Robert Koch, Leona Valley, Calif., Honda CRF450X (1), 65. PRO QUAD—1. Said Sanchez, Tijuana, Mexico, Honda TRX450R (1), 65; 2. Oscar Ruiz, Elcentro, Calif./Jose Contreras, Tecate, Mexico/Juan Mejarado, Tecate, Mexico/Jorge Martinez, Tijuana, Mexico, 59; 3. Edwin Lopez, Juarez, Mexico/Alejandro Gonzalez, Juarez, Mexico/Inaki Elguea, Juarez, Mexico/Alan Arrunada, Juarez, Mexico/Gerardo Mata, El Paaso, Texas, Honda TRX450R, 55. SPT MOTO—1. Sidney Marchand, Beaumont, Texas/Kevin Gravett, Beaumont, Texas/Jim Morton, Austin, Texas/Caleb Bertrand, Lake Charles, La./Nick Lanning, Baton Rouge, La., KTM 500EXC (1), 68. SPT QUAD—1. Juan Dominguez, Yuma, Ariz./Oskar Espinoza, Ensenada, Mexico/Osman Arce, Ensenada, Mexico/Rusty Repass, Honda TRX450R (1), 68.